We can all fall into traps and bad habits when it comes to nutrition, particularly when items are marketed as health foods. And fruit is a huge trap for a lot of people. As dedicated Dr. Gundry listeners already know: our bodies were not designed to eat fruit all year round. However, since we’ve evolved to salivate at the sight of yummy fruits (as a means to bulk up for winter), it becomes really hard to resist those juicy-looking clementines in the produce aisle. 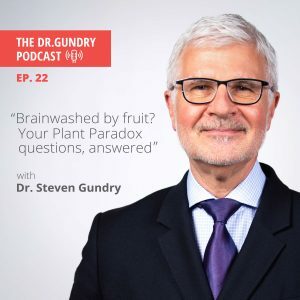 In this episode of the podcast, Dr. Gundry answers your questions and helps you reconcile the gap between what you want to eat, and what you should be eating. 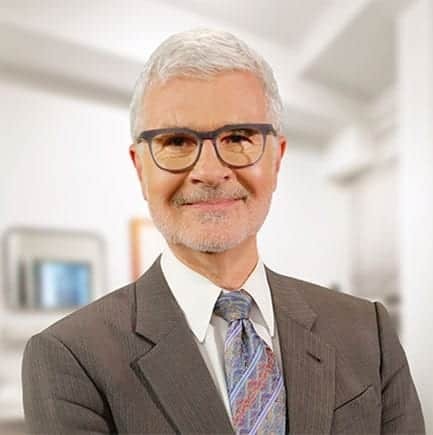 [00:20] Each week Dr. Steven Gundry, a cardiologist, medical innovator, and author of New York Times bestsellers The Plant Paradox and The Plant Paradox Cookbook, shares the latest in cutting edge health information. He’s excited to be a part of your unique health journey, so let’s get started. [00:38] Before we get into this week’s episode, let’s take a look at our review of the week. “New Journey,” by EdesVelas. “I’m really excited to start this journey, I’ve had a list of medical issues such as kidney failure, thyroid cancer, fibromyalgia, et cetera, et cetera. I can’t wait to see the effects this will have on all of my health issues.” Well, EdesVelas, that’s why we do this for you, and please stay tuned. Please read the book. We’re all in this together and that’s why we’re doing this. If you want me to read your review, make sure to rate and review the Dr. Gundry Podcast on iTunes. [01:19] Welcome to the Dr. Gundry Podcast. Today we’re answering some more of your burning questions. These podcasts are some of the most highly requested that I do. You send in questions by email, from YouTube, Instagram, Twitter, Facebook, and today, I’ll be answering a lot of them. [01:37] Here goes. This one’s from Wendy. “What are your thoughts on using the Plant Paradox Diet to address SIBO?” Now, for those of you who don’t know what SIBO is, S-I-B-O, small intestinal bacterial overgrowth. I think the Plant Paradox Diet is probably the best way to address SIBO. Of course, I’m biased, but let me tell you why I think that. First of all, if you have SIBO, you have to understand that bacteria that are present in your small intestine, the ones in SIBO are not supposed to be there. Your small intestine absolutely has bacteria in it, but not what are called colonic bacteria, the bacteria that normally live in your colon. [02:26] Now, I talk a lot about this in The Plant Paradox, but what happens in SIBO is that normally you produce stomach acid to digest proteins that you swallow, and that stomach acid is gradually alkalinized, reduced by alkaline secretions from your liver and from your pancreas, but there’s still what’s called an acid gradient in your gut, so stomach acid, high acid. Down in your colon, there’s actually no acid, and interestingly enough, no oxygen. Now, colonic bacteria, as a general rule, absolutely hate acid. And where that acid gradient stops as things move down your small intestine is right where your small intestine joins your large bowel, the cecum. That’s where things change. [03:34] Now, it’s kind of like brackish water. If you’ve ever lived near the coast, you know that fresh water can have some salt water mixed in it, and a whole different ecosystem is present there. Different dish, different plants. The same thing happens. The acid from the stomach keeps colonic bacteria where they belong, but now in our modern society, we have a huge number of people who have been taking acid reducing drugs, chewing Tums, Rolaids, taking Zantac, taking Nexium, taking Prilosec, taking Protonix, because of heartburn. The problem with that is, it’s suppresses the acid production in your stomach, and what happens to a great number of people is that the colonic bacteria, who have no business being in your small intestine, now notice that the environment in your small intestine is completely changed, and so they swim upstream and colonize an area where they don’t belong. [04:46] Now, the important thing to realize about that is, they have all sorts of interesting things to eat in your small bowel that they didn’t have to eat in your colon, and I think more importantly, the immune system of your small bowel, the lining of your small bowel is covered with your white blood cells, is unfamiliar with those bacteria. It doesn’t know them. There is a ton of inflammation that happens in your small bowel that otherwise would never have happened. [05:20] What we have to do is reestablish the acid gradient. Now, you go, “Well, acid bothers me, because it gives me heartburn and I have to take these drugs to stop my heartburn.” Number one, quite frankly, your heartburn is coming from lectins. It’s actually well-proven in animals. It certainly was the case in myself. I used to have horrible heartburn before I got major lectins out of my diet. Now, it doesn’t exist in me. I used to chew Tums like candy all day. The number one thing is, you’ve got to get acid reducers out of your diet. Now, if you need, for a while, to take calcium carbonate, Rolaids, or Tums, that’s okay as a stop gap measure, but you’ll find very rapidly that you will reestablish your mucus barrier in your esophagus and your heartburn will go away. [06:17] Number two, it’s useful to take a couple of supplements that will increase the acid in your stomach. The most famous of that is called betaine. It’s also called TMG, trimethylglycine. They’re actually equivalent. Many people have heard of TMG because it lowers homocysteine, but it actually does produce increased acid. The third thing is, we’ve got to reestablish where the normal bacteria in your small bowel are. They’ll drive out the colonic bacteria. How do you do that? Number one, probiotics. My favorite probiotic is called BC30, because it’s the only known probiotic that’s a spore former that gets into your small bowel where it belongs without being destroyed. It’s a great policeman of your small bowel. It actually tells the bad guys who aren’t supposed to be there to hit the road. [07:28] Finally, you gotta give the bugs what they like to eat, and that’s where resistant starches come in. Resistant starches, such as radicchio, chicories, Jerusalem artichokes, sometimes called Sunchokes. Things like unripe bananas, plantains, are full of resistant starches. You can, even if you have to, take white rice, particularly white Basmati rice, cook it with about a tablespoon of coconut oil, then put it in the refrigerator and cool it down, and then you can reheat it. We’re gonna get to that question in a little bit. That makes a resistant starch. This is what good bugs in your gut need. That’s the treatment for SIBO. [08:20] BeautifulForMe433. “@Dr. Steven Gundry, is the Plant Paradox Diet good for helping control symptoms of complex PTSD, anxiety, and depression?” That’s a great question. You heard a lot about anxiety and depression and the microbiome in The Plant Paradox, but I’m gonna spend a lot more time on that in my upcoming book, The Longevity Paradox, which debuts in March of 2019. What we now know is that there is a gut-brain axis, and that means that most of the things that happen to the brain, in terms of our mood, in terms of anxiety, and in terms of depression, is actually not happening in the brain, but it’s information that’s coming up from the gut, both in terms of hormonal signals like serotonin, for instance, but also the dopamine GABA system of excitatory stimuli, and calming stimuli. [09:30] These also come up via a giant nerve called the vagus nerve. We used to think that the vagus nerve was how the brain communicated to our gut and all the other organs like the heart and lungs. We now know that for every nerve fiber coming from the brain down to the gut on the vagus nerve, there are nine nerve fibers going the other direction. In other words, from the gut to the brain. What happens is, if you’ve got happy, friendly, good gut bugs, and you give them what they like to eat, they’re going to make, for lack of a better word, feel good, anti-anxiety hormones that are going to travel to your brain and set the stage for recovery. [10:26] Now, the second thing I think that’s very important is that your brain is primarily made of fat. If you want to call your loved one a fathead, I will back you, and you can show him this video. Half of the fat in your brain is a fat in fish oil called DHA, and that acts as a insulator in your brain, and there are some pretty good human studies and certainly animal studies that the more DHA in your brain, the less anxiety and the less depression you have. In fact, in my patients who I treat with anxiety and depression and PTSD, one of the first things I do is try to get large amounts of DHA in them on a daily basis. How much? Approximately 1,000 milligrams of DHA. Now, it’s easy to figure that out. You pick up a bottle of fish oil. You can take capsules. You can take cod liver oil liquid. Look on the back. You’ll see DHA as an ingredient. You’ll see how many milligrams per capsule. Do the math. If you see 250 milligrams of DHA per capsule, you need four of those. Also, look at serving size. Make sure it’s one capsule. So many of the more expensive fish oils, or omega-3s, have two or three as the capsule size, so you can’t be fooled when you look down below. [12:04] Change what you eat. Get BC30 as a prebiotic into you, as a good gut bug stimulator, and then feed your gut bugs what they want, and you’ll be amazed what happens. Also, as I pointed out in The Plant Paradox, lectins are a cause of anxiety and depression. We can’t inject lectins in rats in their bellies. They will become so anxious they will hide in a corner, not come out and seek food, not interact, not explore their environments. This is a plant defense system against being eaten. The last thing you want to do is eat lectin containing foods, and you’ll be amazed what happens. [12:50] Okay. JGoldM. “Thoughts on Plant Paradox for treating diverticular disease?” Okay. We get this question a lot, and first of all, you gotta know what diverticuli are. Diverticuli are hernia in the wall of the large bowel, in the colon. Many of us have heard of hernias in our groins, inguinal hernias. Many of you had probably had a hernia repair. A hernia is just a defect in the fascia around our muscles, and in the hernias that we think about, a piece of bowel wall goes through that hole in the fascia, and that is a hernia. A hernia is anywhere there’s a weakness in a wall. In this case, diverticulitis is a weakness in the muscle of the colon, which is actually incredibly thin. We get these little pouches, these little out pouches. Now, they’re just hernias. [14:00] Now, there’s nothing horribly awful about diverticula, but diverticuli happen when you’re straining to move things through your colon, just like many people know that if you strain down or lift something heavy, that may be the first sign of a hernia, that you will literally pop things out. Think about this for a minute. If you have very hard stool, if you are very constipated, if you’re straining to have bowel movements, back stream of you straining, you’re literally popping little hernias in your colon. The people that we usually see who have diverticulosis have very hard stools, or have a history of constipation. [14:53] Diverticulosis, per se, is remarkably common. Now, diverticulitis is when one of those little out pouches literally becomes infected, and it gets infected because just like a hernia in your groin can get strangulated, it can get trapped, you can trap a little piece of stool in one of these diverticuli, and it gets infected. [15:23] Now, the treatment for that is antibiotics. Sorry, that’s the treatment. Sometimes surgically, we have to come in and take that part of the colon out. My father had to have that years ago. But diverticulosis, per se, we don’t want to increase the number of diverticuli, so what we want to do is have big, giant, bulky stools that move through very quickly. The secret to that is soluble fiber, not insoluble fiber. That, of course, is what The Plant Paradox is based on. The more soluble fiber you eat, the more resistant starches you eat, the more your bacteria eat these foods and the more bacteria grow. These big, giant bulky poops are what you want to keep diverticulosis under control. [16:24] Now, there is this wonderful myth that you can’t have nuts and you can’t have small seeds when you have diverticulosis, and that may be one of the biggest myths out there. In fact, nuts are one of the best ways to promote soluble fiber and growth of friendly bacteria. I actually prescribe nuts to my patients with diverticulosis, particularly walnuts and pistachios. You ought to have about half a cup a day. More if you want. Now, be careful. Too many nuts, you’ll start gaining weight, and in fact, I use nuts to help people gain weight who need to gain weight. But don’t fall into this trap that you have to have a low fiber diet for diverticulosis. It’s exactly the opposite. You want big, bulky stools that move through you quickly. [17:18] Okay. AdriannaCH3212018. “Is carrot soup made with onions and carrots, salt and pepper, and ground ginger safe? I’m so lost here. Also, what are seasonal fruits in Montreal in winter? Like none.” Let me ask that question right away. Correct. There are no seasonal fruits in Montreal in winter. Nobody ate fruit in Montreal in the winter. It did not exist. I grew up in Omaha, Nebraska and Milwaukee. There was no fruit in the winter. There were no 747s bringing blueberries to Costco in February from Chile. You were not designed to eat fruit in the winter. Believe it or not, your ape cousins do not eat fruit in the winter, because there is no fruit. We know that our foraging tribesman, like the Hunza, do not eat fruit in the winter, because there is no fruit. There is not a need for 365 days of fruit. Get over it. You’ve been brainwashed into thinking you need fruit 365 days a year. [18:34] Okay. “Oh, I just saw this awesome box of clementines. Can I eat it?” No. If you want to have a special splurge, let’s say it’s a holiday, let’s say it’s Valentine’s Day, and you want a clementine, go ahead. But the idea is there is a season for everything, and I got news for you, there’s no season for fruit in Montreal. [19:03] Back to carrot soup. When I see people with diabetes, or insulin resistance, or pre-diabetes, or with cancer, one of the things I want to get away from them as much as possible are carbohydrates. Simple carbohydrates. Easily digestible carbohydrates. A raw carrot is actually pretty safe, because it’s actually quite slowly digested. But the process of cooking is going to make those complex sugar molecules far more digestible quicker, so it’s going to become sugar quickly. [19:43] For instance, beets. In Italy, there are many restaurants that serve raw beets that are very thinly sliced, that have a little sprinkling of goat cheese, some parsley, and then pour olive oil on them. That’s a great meal. A raw beet is a very nice complex, resistant starch. But when you cook that beet, it changes it to a much more available starch. [20:12] Back to your carrot soup. The onions and carrots, salt and pepper and ground ginger sounds delicious, but here’s the deal. If you’re going to have that soup, I want you to think of that soup as a medium to get olive oil into your mouth. If you, or if I was served that soup in Italy, the waiter would bring the bottle of olive oil, and he would pour, oh, five, six tablespoons of olive oil into that soup, and I would mix it around, and so I basically have a carrot and olive oil soup. Now I have a heavy olive oil flavored soup that’s actually gonna be good for me, and it’s gonna blunt the effect of those now fairly easy to digest carbohydrates. You can have your soup and eat it too, if you keep saying that the only purpose of food is to get olive oil into your mouth. [21:11] I know. I know cold winters, and you want something warm and comforting, but let’s make it warm and comforting with a bunch of olive oil in it, and enjoy your Montreal winter. It’s a beautiful town. [21:24] Anita Mahara. “Hello, Dr. G. Been on the Plant Paradox Diet for four months! Amazing results! Wanting to know if Achi is lectin-free.” Okay. It was stump the stars on this one. I had to look it up. You’re probably from Jamaica, or perhaps from Africa, and for those of you, like I, who did not know what Achi was, it’s a cousin of a lychee nut. The reason I didn’t know it, because the FDA does not allow Achi, which is a fruit, very much like a lychee nut, or Achi fruit pulp to be imported into the United States, because quite frankly, there’s a high danger of toxic poisoning. In fact, in Haiti, in 2001, there were 61 cases of Achi poisoning, 36 of whom died. It contains an incredible toxin that is present when the fruit is picked unripe, and unless you know what you’re dealing with, it’s dangerous. [22:39] Now, having said that, I’m not quite sure I even worry about whether there’s a lectin in something that’s that toxic. Now, if you live in a native country, for instance, like Jamaica, that know how to harvest it, as you know, salt cod and Achi is one of the national dishes, but you better make sure that the cook knows what they’re doing, but please don’t have it in the United States, and if you found it in the United States, it came in here illegally, so it’s doubly suspicious that it’s available. [23:11] Ted B. writes in, “Hi, Doc. Plant Paradox has helped reduce inflammation that affected nerves in my back. Thank you. What are your thoughts on natural sugar found in home garden grown oranges? Some sources say natural sugars are anti-inflammatory, contrary to regular sugar. Thanks. Ted B.” Sugar is sugar is sugar. Now, the natural sugar in fruit is fructose. You probably saw in The Plant Paradox that fructose is a natural toxin. It is so toxic that about 70% of the fructose that we eat in fruit is taken immediately to the liver. It’s not allowed into our bloodstream, where it is detoxified by our liver into triglycerides, which is a fat, and into uric acid. Uric acid causes gout. It also causes kidney damage. Now, the other 30% of fructose goes directly to the kidney, where it’s a renal toxin. The idea that a natural sugar is somehow better for you just doesn’t hold water. It’s like saying arsenic is all natural, which it is, and so we ought to have it. Quite frankly, opium is all natural. That doesn’t mean it’s good for you. [24:46] Now, you’ll see in my upcoming book, The Longevity Paradox, that there’s now evidence that fructose is lethal to mitochondria, the energy-producing organelles in our body. That’s why I really ask you to eat fruit in season, and limit it. We used fruit like all other great apes, to gain weight for the winter when there wasn’t much food. We converted the toxic fructose into triglycerides, which we stored as fat. We want to move with the seasons. There’s only a time and a place to eat fructose, natural sugar in fruit, and that’s in the summer, but please limit the amount. It’s not a health food. [25:39] Fernando Olivera. “I might be the only one on earth, but I love chayotes. Are they acceptable on your diet?” Yes. They absolutely are, with the proviso that they are a seasonal fruit. They actually, particularly if you don’t let them ripen all the way, they have a lot of soluble fiber. That’s, I think, one of the reasons that people don’t particularly like them. I actually love them. My wife hates them, so I hear what you’re saying. She does not understand how anyone could tolerate that taste. But they are a great source of soluble fiber. Don’t let them get too ripe. It’s just like a pear. A crispy pear actually is an excellent, very high soluble fiber fruit. If you’re going to have a fruit in the winter, a crispy pear like a D’Anjou pear, with a salad, mixed in a salad, is a great way to get resistant starches into your diet. And as you’ll see, actually in The Longevity Paradox, that pears are a great source of this compound called spermadine, and I’m gonna be talking a lot about that in the next few months. [26:58] Josh Mandell. “Is mung bean in the same lectin field camp as other beans, despite being ancient? Mung bean flour pasta is sold in health food stores, like Whole Foods.” Yeah, and whole wheat pasta is sold in health food stores like Whole Foods, and it’s just as bad for you. Mung beans have the same lectins that other beans have. It appears that mung beans, when they’re sprouted and have reached a fairly long stage, their lectin content does decrease, so if you want to eat mature sprouted mung beans, they’re probably safe, but I test people against mung beans, and quite frankly, a large number of people who are lectin intolerant do react to mung beans. There’s far better sources of pasta than mung beans. Just because they’re ancient doesn’t make them any better. By the way, farro, that ancient wheat, is still wheat. [28:00] All right. We’re gonna wrap those questions up for now. I just want to mention that the Plant Paradox Quick and Easy Challenge, the 30-day challenge, is going on right now. To find out more about that, you can look to DrGundry.com for more information. Get the book at Barnes and Noble, Amazon.com, your local bookstore. Join in the challenge. I am going to be Instagramming every day. I’m gonna do it with you. 30 days of fun, to make this work, and we’re gonna hopefully conclude on Valentine’s Day, so join in the challenge. I’ll see you back on the next podcast. This is Dr. Gundry, and I’m always looking out for you. [28:52] For more information about this week’s episode, please take a look at my show notes below, and on DrGundry.com. In the show notes, you’ll also find a survey, and I’d love to find out more about you. Please take a few minutes to fill it out so I can do my best to provide information you’re looking for. [29:11] Thanks for listening to this week’s episode of the Dr. Gundry Podcast. Check back next week for another exciting episode, and make sure to subscribe, rate, and review to stay up to date with the latest episodes. Head to DrGundry.com for show notes and more information. Until next time, I’m Dr. Gundry, and I’m always looking out for you. I really appreciate your podcasts, books, website and everything else you do to empower people to live a healthier lifestyle. There is one thing I don’t quite understand. With almonds, you can not eat the skin. You must eat them blanched. But, in your book you say that almond butter is alright. We’ve made our own blanched almond butter just to be on the safe side, but we have also broken down and bought regular almond butter because you say it is alright. Just wondering how and why. Also, what do you think about sprouting nuts?